Madonna stayed a high-heeled step ahead of pop music and NFL fans alike during her halftime show crammed with big-name guest stars. 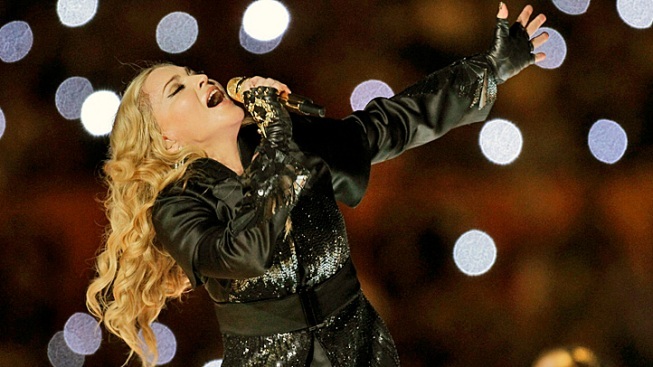 If you thought it was hard to keep up with Madonna and her ever-changing personas in the 1990s, it was even harder to keep up with all the guest stars she managed to squeeze into her far-ranging 12-minute Super Bowl performance Sunday. The Material Girl also managed to cram three costume changes and seven songs into her stunning show, which hit several periods from her 30-year career right up to "Give Me All Your Luvin," the single she released just Friday. Too bad guest M.I.A. marred that song by flipping off the cameras, a gesture sure to grab many of the headlines from the otherwise smooth show. In true Madonna style, though, the night was about Madonna: Make no mistake, her guests were featured with the goal of complementing and saluting Her Madgesty. The spectacle opened with what seemed like a legion of Roman-like soldiers joining her to perform "Vogue," her 1990 homage to a dance craze in New York's gay dance clubs, complete with signature moves, which were updated Sunday. Madonna smoothly moved on to 2000's "Music" and took a quick detour to dance with LMFAO, a group squarely placed in 2012. Then it was on to "Give Me All Your Luvin" with a bunch of cheerleaders who chanted, "L-U-V, Madonna" — including M.I.A. and Nicki Minaj, who both appear on the brand new single. M.I.A. delivered a smooth rap but also raised her middle finger before cameras could cut away — a move that stoked memories of Janet Jackson's infamous wardrobe malfunction of 2004, which provoked an FCC investigation. It was unclear what, if any, the ramifications would be from the obscene gesture. But the show went on, with a revved-up medley of Madonna's greatest hits, including "Open Your Heart," "Express Yourself" and a choir-backed version of "Like a Prayer," featuring a surprise appearance from Cee-Lo. It's probably not surprising Madonna would remind fans why they loved her so much in the first place with a strong finale remembering her past. Friday, Madonna released the single "Give Me All Your Luvin," just a preview of her 12th album, "MDNA," to be released March 26. The Material Girl hasn't released an album since 2008's "Hard Candy." Of course, Madonna was not the only big name to entertain Sunday. While the half-time show is traditionally one of the celebrity high points of the Super Bowl, there are still plenty of other A-lister appearances throughout the game itself and during the commercials (which also include a fair number of B-listers). Earlier, original "American Idol" Kelly Clarkson sang a practically pitch-perfect rendition of the national anthem. Backed by a children's choir and wearing sophisticated thick bangs and sleek, straight black hair, she looked far different than the girlish singer who wowed America back in 2002. And making sure to hit all genres of popular music, the whole event kicked off with Miranda Lambert and "The Voice" star Blake Shelton singing a twangy, countrified version of "America the Beautiful" that had some folks in the audience in tears. Fabulous live performances aside, the celeb who had everyone talking was a heavily-tattooed and mostly naked David Beckham staring soulfully into the camera in rather snug underwear in a black-and-white ad for his new line at H&M. Sometimes a spectacle can be quiet, too.